Her last words would no doubt have been "Islam is a religion of peace" just as her head was coming off. If it wasnt for all these darn infidels, it would be peaceful, so yeah the ends always justify the means. Tories are screwing everyone over. Lots more homeless on the streets since these new benefits rules came into force and these were put in place because of a minority of people swindling benefits . Not my Country, but maybe, just maybe, if you didn't have so many immigrants on the dole, as you say, you wouldn't have these problems. I think he said a minority of people swindling not minority people swindling. As far as I know most immigrants work hard over here, the rate of pay makes it vry profitable for them to do so. I know what they said. The U.K's already over stressed social support networks didn't need more people from the outside the U.K. adding even more burden on it. In 2014, 4.9 million (92.6 per cent) working age benefit claimants were British while only 131,000 (2.5 per cent) were EU nationals. The number of recipients from outside of the UK — but not from the EU — was 264,000 (five per cent). Likewise, in the latest data from 2013 for those tax credits, 3.9 million (84.8 per cent) families receiving the benefits were British citizens, 302,000 (6.4 per cent) were EU citizens and 413,000 (8.8 per cent) were from outside of the UK. 7.5 % of working age people receiving benefits were from outside the UK and 15.2% of families receiving benefits were from outside the U.K.
Sugarcoat it all you want. They are the reason your system is welfare system is stressed. It's a significant percentage and number that doesn't help your situation. Your own link says "In 2014, 4.9 million (92.6 per cent) working age benefit claimants were British while only 131,000 (2.5 per cent) were EU nationals. The number of recipients from outside of the UK — but not from the EU — was 264,000 (five per cent). " So are you saying that the welfare system is stressed not from the 92.6 percent of British claimants but the 5% who originate from outside the UK? Only 2.5% from within the EU and that does not take into consideration the number of UK nationals living in the EU and claiming benefits in other countries. Are you really saying that 5% is a signifcant percentage?
. Read the whole thing......15.2% of families receiving tax credits, which I assume mean low income, are Non British. It's your Country. Your problem. You have to deal with it and pay for it, not me. Tax credits are a system to top up the earnings of low paid families meaning they can still work and have a living wage. Just grabbing figures without having any idea of what you are talking about is not a great way to put forward a winning argument. You might be better off taking part in a discussion on something you understand. Lol, the number of Non UK citizens getting tax help is a drain on your system. It is. You can deny it's "just a little" but you try and make ends meet on 15% less income and let's see how your life changes. Those were 2014 numbers, have they grown or shrunk since then? Again it's your problem, I'm merely pointing it out. Cursing at the messenger rather than the actual message. I am not cursing the messenger I am saying that the messenger does not have enough of a grasp of the situation to give an accurate message that's all. I am not an economist but am pretty sure that 5% of non eu claiming benefits at any one time would not be considered a major contributing factor. Zero unemployment is unfeasable and not good for an economy. Don't worry, I'm sure in the near future Commissioner Mohammed will be working closely with Mayor Mohammed and Prime Minister Mohammed to crack down on radical Islamization. In all seriousness, when Islam has the numbers to start influencing elections and setting policy the UK is going to be in serious trouble. Thank you for typing what I couldn't be bothered to. We've actually gotten to the point where people are now defending the IRA as an excuse to justify the rise in radical Islamic terrorism. At least we can agree that there are striking parallels between the two. A regular Bobby is not the same as an armed officer. 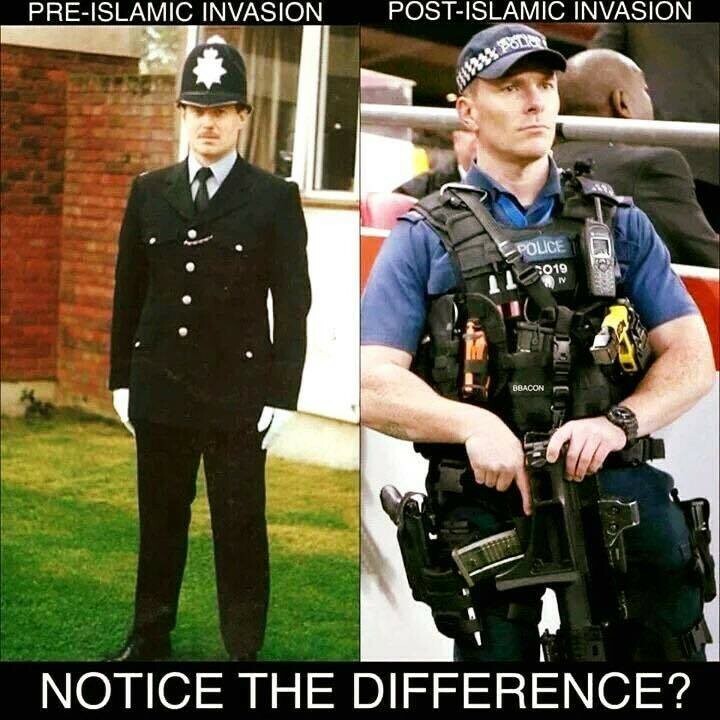 Regular Police do NOT carry firearms in the UK. I'm guessing you are American. Armed officers on duty only happened after 9/11 for a time. Good luck with the hyperbole and fear though. Is 15% of tax assistance credits going to non UK citizens not a major factor either? We obviously disagree. You are the one footing the bill for it, not me. Enjoy it. Balance your budget by cutting benefits to all. There's a finite amount of money for such things, spend it how you wish. I'm sure you have noticed its Americans that buy into the fear as they have been conditioned to, the media influence in everyday decision making is substantial.